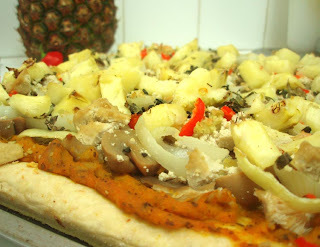 Vegan Chef Battle: Mushroom Pizza Crazies w/ Pumpkin Sauce! Combine dry ingredients (except corn meal). In a separate bowl combine yeast and water and mix until dissolved. Let the yeast get frothy, about 10 mins. Add the oil and garlic to yeast mixture, then add the wet to the dry. Knead for a few mins then roll out into a pizza shape. Grease a pan and dust with cornmeal. Bake on 450F for 5-10 mins or until firm to the touch. Combine all ingredients for sauce. Heat to boil then lower to a simmer and cook while you prepare toppings. If its too thick add a little more stock.